The NHS is winning the battle to convince people to stop smoking, health officials say. Calls to the NHS Smoking Helpline rose six-fold in the New Year to 15,000 with the start of an advertising campaign. And the number of people who quit smoking after attending a cessation clinic increased by nearly 50% to 107,800 year-on-year, the NHS said. 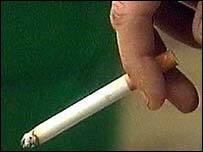 In 2004, more than 200,000 people quit smoking with help from NHS stop smoking services - a record figure - it added. The New Year advertising campaign featured real people who had quit with help from the NHS and carried the slogan "If you've got the will, we've got the way". NHS Smoking Helpline adviser Alexia Paterson said: "These last few weeks have been the busiest we can remember. "Smokers are calling in their droves to seek advice and guidance on how to quit or to find out about their local NHS stop smoking services." Public Health Minister Melanie Johnson said the NHS campaigns were making real progress. "The latest campaign has been one of the most successful since the local NHS stop smoking services were launched. "We know that 70% of smokers want to quit and the response over the last few months is evidence that more and more are being encouraged to take that first step either by calling the free NHS Smoking Helpline or visiting their local service." But the NHS still has a long way to go with about 12m adults in the UK smoking cigarettes - 27% of men and 25% of women. "Some smokers might be nervous or worried about getting formal help to quit," he said. "GPs need to reassure people that smokers' clinics are not embarrassing or mysterious.